Skull tattoos aren't just for the hard-core punk crowd, girly skull tattoos can feminize any skull, making it perfect for even the most delicate wearer. If you're looking for a way to feminize a skull tattoo, and make it more girly looking, there are plenty of ways to do so. Use any of these images, either alone or in combination to create a unique tattoo of a girly skull. Who says a skull has to be black and white or bone colored? Take some inspiration from Mexican sugar skulls and use color to enliven your design. Whether you create a pink skull, or a multicolored one, color can quickly add girly detail to your skull. Other color options include coloring the crossbones, or coloring the eye sockets in a feminine color for depth while the rest of the image remains black and white. Give your skull a bow for a contrast in feminine and punk rock images. The bow can be combined with nearly any feminine skull image, such as color, hearts, stars or flowers for the ultimate girly skull. Rather than keeping the eyes of the skull round, consider making them heart shaped. This subtle detail can add some interest to your design without overwhelming it with girly images. An alternative would be to surround the skull with hearts, or crowd the hearts up against the image of the skull for a contrast in images. You can also place hearts on the four corners of crossed bones to incorporate them more fully into the design. Give a butterfly design a skull head for a hidden skull that pops when you find it. 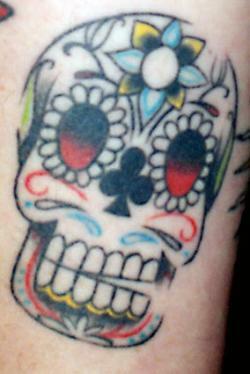 This death masquerading as life image can be a fun scene to add to any larger scale tattoo. A butterfly can also perch on the top of a skull in place of a bow to feminize the look. Star tattoos are one of the most popular girly tattoo images; combine stars with a skull to create a girly tattoo that's tough as well. Stars can be placed in the eye sockets, up against the skull, surrounding the skull or the skull can be centered in the middle of a larger star for a glam look. No matter what type of skull tattoo you're after, make sure it truly suits you and encompasses both your girly side and your punk side by incorporating other images that speak to you. The end result should be a girly skull tattoo that is as unique and feminine as you are.